Apple have refined the design of their slim and powerful MacBook Air. Made from 100% recycled lightweight aluminium, it features a whole host of great connectivity options, with a pair of Thunderbolt 3 (USB C) ports. It's thinner and lighter than ever, the perfect combination of power and portability. How does this new model compare to previous versions? The 2018 MacBook Air features internal and external refinements over the previous model. The most obvious addition is the Retina display, which offers a pin sharp image, with a slimmed down bezel for an impressive overall impact of images and videos The Thunderbolt 3 / USB C connections give you more compatibility options for accessories, with a 3.5mm headphone jack for audiophiles Security is boosted with the addition of Touch ID, so you can log in safely and even pay for online shopping with the touch of a button The reduction in bezel size and re engineered design makes the 2018 MacBook Air 10% thinner than its predecessor. Visual Communications The screen on the 2018 MacBook air has been upgraded to a Retina display, with a resolution so high that individual pixels can't be discerned with the naked eye. Packing in 48% more colours than the screen of the previous model, the bezel has been slimmed down, giving an impressive working space as well as increasing the impact of media. Even with the super thin bezel, Apple have retained the FaceTime camera for crystal clear video calls. For FaceTime the new MacBook features three microphones rather than the dual array of the previous model, so people will be able to hear you more clearly without crowding the screen. Thin, Light and Durable Since Steve Jobs first pulled the original MacBook Air from a slim envelope, the MacBook Air has focused on delivering portability thorugh its slim and light design. The 2018 MacBook Air 13 inch measures just 1.56cm at its deepest point and weighs an astonishing 1.25kg, making it ideal to take with you. The amazing portability of this machine is helped by the PCIe based SSD. It doesn't have any moving parts, which means it's more reliable and quiet. Lightning fast, durable, silent — qualities that make sense in a laptop tasked with keeping up with you. Improved Keyboard Despite its size, MacBook Air packs a full size keyboard that makes typing as natural as it is comfortable. The keys have been redesigned for greater comfort and more responsive typing, with a Butterfly mechanism replacing the traditional scissor mechanism. It's also backlit, so you can type with ease in even the dimmest light. A Secure Option Apple have incorporated Touch ID into the keyboard, as well as Apple's state of the art T2 security chip. It also makes online shopping easier by using Apple Pay at checkout just one touch and you're done. This chip also means you can have Apple's virtual assistant Siri to hand whenever you need her. 8th Generation Intel Core i5 The eighth generation Intel Core i5 processor will handle whatever you throw at it, allowing you to multi task and work on intensive applications without experiencing any lag. Running at a base speed of 1.6GHz with a Turbo Boost speed of 3.6GHz, applications run faster and more efficiently than before. So everything you normally do on a computer you can do even quicker. Send email, write reports, create presentations, touch up photos, edit home movies and all the little (and big) tasks in between. The i5 uses the Intel UHD Graphics 617 GPU to ensure visuals are smooth whether you're playing a game, watching a video or editing a photo. 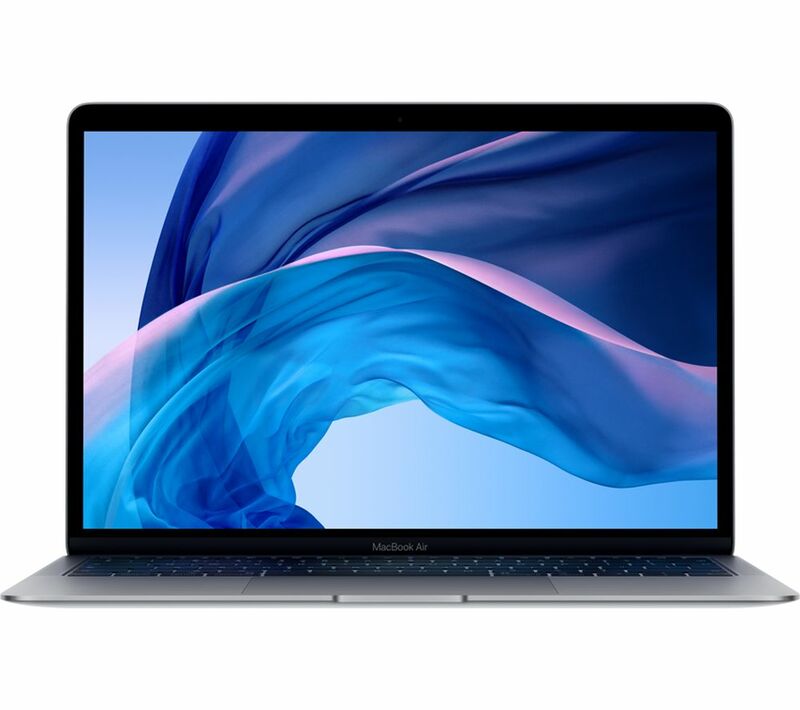 All Day Battery MacBook Air 2018 features a large battery that works with the power efficient eighth generation Intel Core processor to last all day. You can expect up to 13 hours of battery life on a single charge while watching iTunes films, or 12 hours of wireless web browsing. MacBook Air will also preserve its own battery life by entering standby mode after it's been asleep for more than three hours, helping to conserve battery life for up to 30 days. You can even continue to receive new emails and calendar invitations while your MacBook's asleep by enabling Power Nap. Faster Connections With 802.11ac Wi Fi you'll be able to connect to an 802.11ac router and experience wireless performance that's up to 3 times faster than previous generations. Bluetooth 4.2 will allow you to connect to Bluetooth enabled devices like speakers, headphones and other computers to stream and share files without wires. Two Thunderbolt 3 (USB C) ports will allow you to connect peripheral items such as mice, printers or USB storage devices, also supporting charging, DisplayPort, and USB C 3.1 Gen 2 devices Additional information: manufacturers often update their Operating System (OS) software over the course of a device's lifespan this means that your product might ship with a more advanced OS than specified. Looking for a case? Take care of your new equipment with one of our cases. Please click here to browse the range. Do you need a cable, a portable charger or more storage? Whatever your additional gadget requirements maybe, we'll do our best to look after you. Please click here to browse our technology peripheral range. Thought about Added Care? No one ever means to drop their prized device regrettably, we've all done it. Please click here to see if Added Care could provide you with extra peace of mind when using your technology.